A style in Qt is a subclass of QStyle or of one of its subclasses. Styles perform drawing on behalf of widgets. Qt provides a whole range of predefined styles, either built into the Qt Widgets module or found in plugins. Styles are usually customized by subclassing QProxyStyle and reimplementing a few virtual functions. While QProxyStyle provides a transparent way to customize either a specific style or the appropriate platform's default style, Qt also provides QCommonStyle as a convenient base for full custom style implementations. 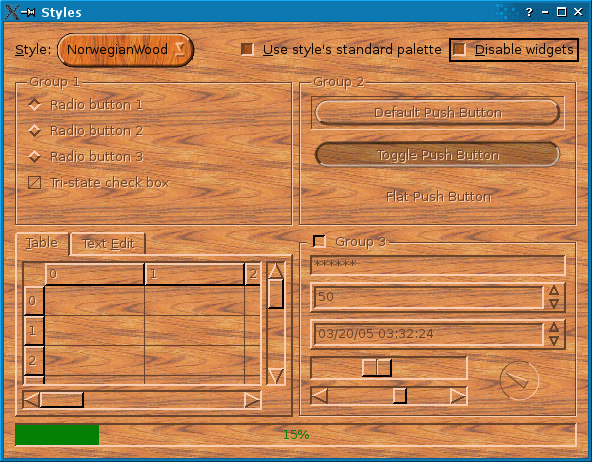 In this example, the custom style is called NorwegianWoodStyle and derives from QProxyStyle. 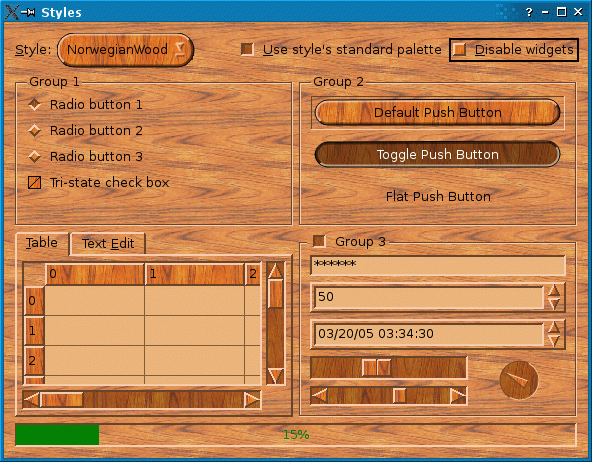 Its main features are the wooden textures used for filling most of the widgets and its round buttons and comboboxes. NorwegianWoodStyle inherits from QProxyStyle and implements the Norwegian Wood style. The public functions are all declared in QStyle (QProxyStyle's grandparent class) and reimplemented here to override the Windows look and feel. The private functions are helper functions. The pixelMetric() function returns the size in pixels for a certain user interface element. By reimplementing this function, we can affect the way certain widgets are drawn and their size hint. Here, we return 8 as the width around a shown in a QComboBox, ensuring that there is enough place around the text and the arrow for the Norwegian Wood round corners. The default value for this setting in the Windows style is 2. We also change the extent of QScrollBars, i.e., the height for a horizontal scroll bar and the width for a vertical scroll bar, to be 4 pixels more than in the Windows style. This makes the style a bit more distinctive. For all other QStyle::PixelMetric elements, we use the Windows settings. The styleHint() function returns some hints to widgets or to the base style (in our case QProxyStyle) about how to draw the widgets. The Windows style returns true for the QStyle::SH_DitherDisabledText hint, resulting in a most unpleasing visual effect. We override this behavior and return false instead. We also return true for the QStyle::SH_EtchDisabledText hint, meaning that disabled text is rendered with an embossed look.